The walk down Michigan Avenue on a mid-autumn afternoon is, by anyone’s standard, an exercise in aesthetic indulgence. Millennium Park seems lush and jolly, with high-pitched squeals of playing children complementing the quiet sojourn of couples picnicking in the grass. The Pritzker Pavillion’s spider-like stainless steel ribbons billow out from the stage beneath it, and the sparkling facades of high-rise buildings create a skyline commonly recognized as one of the most beautiful in the world. The Art Institute’s famed bronze lions crouch proudly at their posts, half-lit in the soft golden sunshine that pours onto the city; the air is fresh, the streets are clean. It is effortlessly beautiful, and it all stands in wait for you—a free, autonomous body just passing through—to indulge in. Just across the street from these feline gatekeepers sits the Gage Gallery, an art museum with a single gallery, operated by Roosevelt University. Located on the first floor of 18 South Michigan Avenue, the gallery space is dimly lit and somber. There is a certain quietness to it that feels a bit like solitary confinement, or at the very least produces an uncomfortable feeling of containment, further pronounced by the general emptiness of the white-walled space. The gallery maintains a stark and uncompromising opposition to the picturesque vibrancy of the world outside. The subject matter of the gallery’s latest exhibit, Juvenile-in-Justice, reflects the austerity of the space itself. The exhibit provides a glimpse into the world of the nearly 70,000 American minors who are held in juvenile treatment centers across the country. Six years ago, artist Richard Ross began work on a long-term photography project that aims to document the lives of American youth housed by law in correctional facilities that treat, assist, detain, punish, and harm them. Ross has traveled all over the country to hundreds of these facilities, courtrooms, and police departments, and has spoken with more than 1,000 juveniles from 30 different states. He has asked them for their stories, taken their portraits from within the institutions that contain them, and, finally, assembled these histories into a formal exhibition that proactively promotes social change. The exhibition, which is presented by the Mansfield Institute for Social Justice and Transformation, is composed of a couple dozen photos of these youth, each coupled with a distinct panel that details their story and offers a quote or two provided by the person depicted. 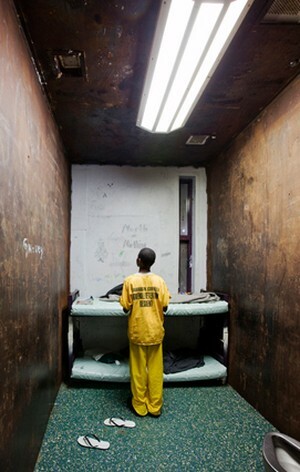 Many of the photos highlight through saturated imagery the unlivable conditions of the treatment centers. A fluorescent glow permeates the gallery, lighting up shots of windowless, bare rooms that are either dirty and mold-stained or all-too-clean. Most rooms do not have beds or any other kind of furniture. Those few that include resting spaces, for the most part, lack sheets or pillows, and the “beds” (they look more like gymnastics mats to me) are positioned on top of wobbling wooden frames or solid concrete. The dehumanizing nature of these treatment centers is further emphasized by the stylistic choices Ross makes in his portraits. Girls and boys as young as eight are featured within their respective rooms, but their presence is always somehow distorted. Some crouch in dark corners, facing away from the camera. Others are caught in motion, evoking a bursting, youthful energy that seems cruel to keep inside a dank, windowless cell. Others are perfectly still and face the camera, but Ross has intentionally distorted their faces, which are reduced to a series of uncanny blurs. Still others reveal the body in fragments. A pair of anonymous hands, handcuffed to the door behind which the rest of the body hides, stick out from a food slot that serves as the only gateway between the imprisoned youth and the outside world. Ross is keen to showcase the lives of those stationed within juvenile treatment centers in an extremely personal way that evokes a strong emotional reaction from the viewer. He stresses the reality of the situation by integrating every photograph with a quote from the youth pictured. We see a frail-looking 15-year-old blond crouched on her makeshift bed, thick hair covering her face, and we simultaneously learn that she is a self-harming heroin addict. We see a close-up shot of a blue-green eye covered in unsightly red and black bruises, only to learn that its owner, a 15-year-old runaway, was punched by her girlfriend two weeks ago for her struggles with alcoholism. She assures us that her eye “looks a lot better now” than it did originally. A 14-year-old boy lying on his bed is suddenly revealed to be an eight-times-convicted runaway charged with police evasion, sexual assault, and armed robbery. Perhaps the most disturbing piece in the exhibit is not an image of personal suffering at the hands of governmental negligence, but rather one that is a cold, calculating indicator of how truly dehumanizing these detainment centers are. It is a snapshot of the “Wall of Shame” at the Miami-Dade Regional Juvenile Detention Center in Miami, Florida—what might be an all-too-appropriate name if that shame was directed at the operational policies of the center itself and not at the deceased youth pictured. The wall features mug shots of a couple dozen of the Center’s outpatients from 2000 to 2010—teenagers who have since met their deaths by gunshot wounds—mostly related to gang violence. Upon their portraits, the word “EXPIRED” (no, not even “deceased,” which at least signifies some humanity) is written in caps, usually in red sharpie marker, often across their faces. Some of the deceased youth’s faces are even crossed out with permanent market. One employee had the nerve to write “Life over! No more freedom!” over two of the portraits in a way that pathetically and infuriatingly carries with it the assumed tenor of something as trivial as a video game, something to which no human life should ever be compared. Ross’s work is located at the intersection of art, social practice, and politics. It presents itself as a fundamentally artistic endeavor that uses its gallery space as a site within which to participate in a transfer of knowledge. But it is not illuminating in the same way that a Monet painting, with its soft, meditative pools of greens and blues, might be. It does not allow for a gentle self-analysis; there is no room for a comfortable exploration of the viewer’s own psyche. Rather, it is meant to reveal the injustices that plague the operational standards of these detainment centers and, furthermore, to highlight the dehumanizing and overwhelmingly unacceptable treatment of their residents. The exhibit inspires a sense of urgency within its viewers, aiming to promote a dialogue among visitors to the gallery that might eventually pave the way for change. Seeing the exhibit will not be a casual or easy affair, but it is a vital one, for it houses a long and affecting history of suffering to which every citizen of this country dearly needs exposure. Juvenile-in-Justice runs at the Gage Gallery through December 15.